Like many of you, I love to spend my free time outdoors. I especially enjoy when I can combine maps and the outdoors! Before the fishing season opens May 3rd be sure to scout your favorite lakes. I also recommend downloading The Official Guide for Wisconsin’s Fishing, Hunting and Wildlife app to your smartphone. The app gives you access to fishing regulations and more maps among other things. MADISON (Wi DNR Weekly News Release) – Anglers and fish enthusiasts alike can now see where their favorite fish species have been found using an interactive Department of Natural Resources research tool that shows results from fish surveys dating as far back as 130 years. Click on image to go to fish mapper website. 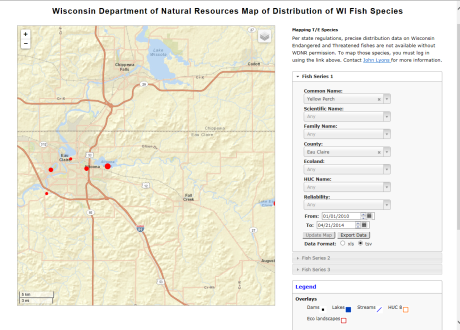 The online fish mapping tool lets anyone search the more than 160 fish species found in Wisconsin by either county or habitat types. Data points on the map are pinpointed by GPS coordinates and show the kinds of fish species were found during a given research outing. The tool offers a fun interactive application for anglers and there is a tutorial video on the fish map website (exit DNR) explaining how to use the map and along with terminology. The fish map tool was created in partnership with the US Geological Survey Center for Integrated Data Analytics and is used by DNR researchers to study long term trends for fish populations in Wisconsin.